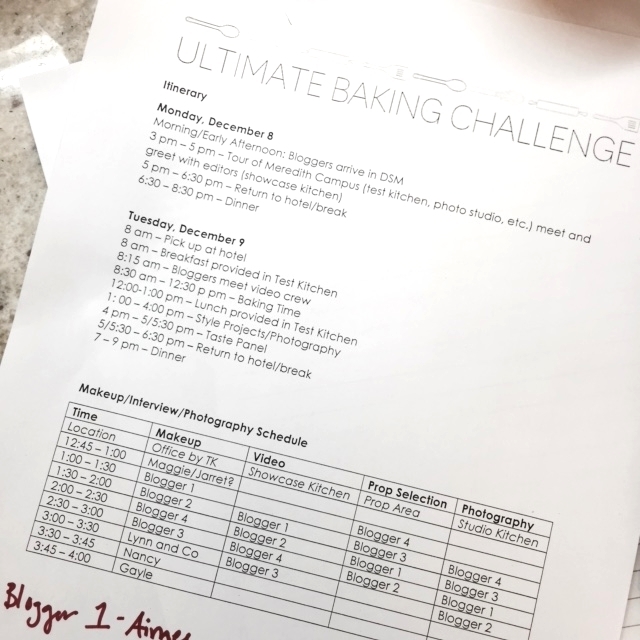 If you have been following along here, I have been participating in the Better Homes and Gardens Ultimate Baking Challenge. The initial sixteen bloggers were narrowed down to the final four through two rounds of online voting. For the initial challenge, I made a Cranberry Orange Pull Apart Bread that was topped with sliced almonds and an orange cream cheese glaze. For the baking challenge, I made a new recipe but stuck with my cranberry-orange theme. My final recipe was a Cranberry Orange Pound Cake with a Champagne Glaze. Update: This is the WINNING recipe! That’s right! Thanks to your help, I have won the Ultimate Baking Challenge. Make sure to head to Better Homes and Gardens and get the recipe! I would be overjoyed for whoever wins, because each one of their recipes was outstanding. 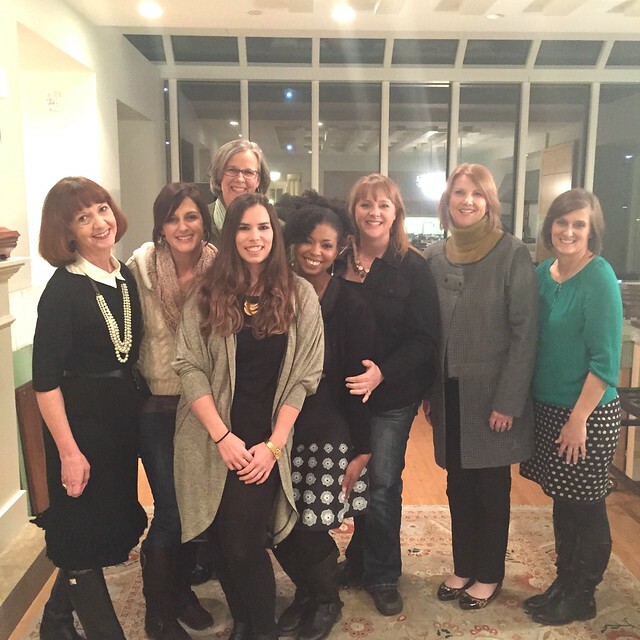 Every blogger that participated in this contest is extremely talented. I just happen to be in the final four with three of my good friends: Amanda of I am Baker, Jocelyn of Grandbaby Cakes and Aimee of Shugary Sweets. Sharing this experience with them was nothing short of incredible. It was filled with laughter and a little bit of stress. If you would like to get the recipe directly, click here. 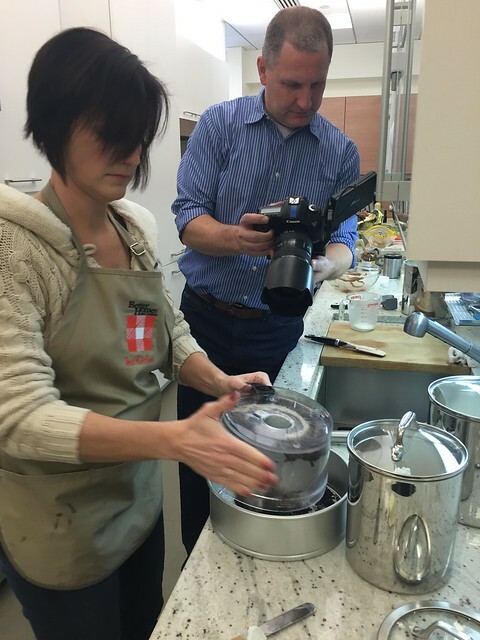 Better Homes and Gardens also put together this fun video from our time in Iowa. I’m such a dork. Now let’s talk drama. 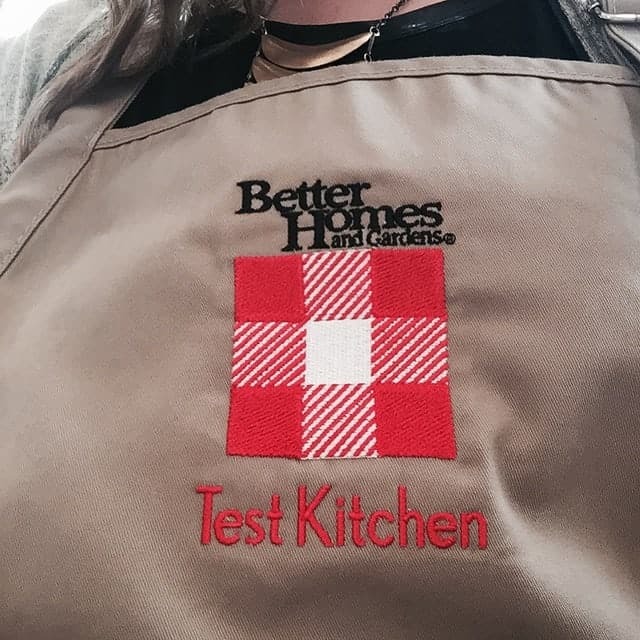 Last week, I headed to Iowa for the Bake Off Challenge in the Better Homes and Gardens test kitchens. It was the quickest day ever! I didn’t have an easy time getting there. I missed a connection in Dallas and got stuck for 8 hours! 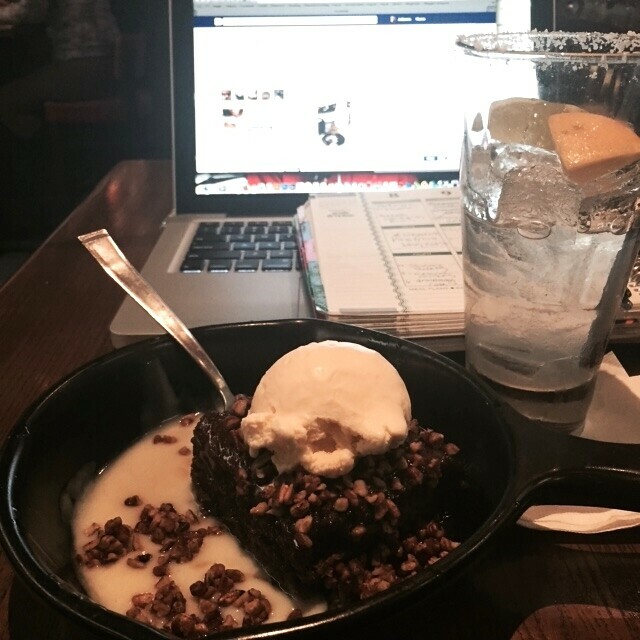 This is what it looks like to spend 8 hours in an airport: dessert and margaritas. I was relieved to finally arrive late Monday night. Tuesday morning we were up bright and early. We wasted no time getting started. 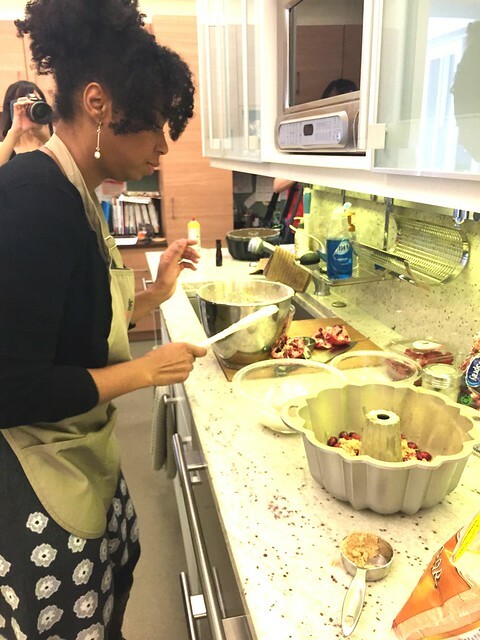 Each baker was provided enough ingredients to make their recipe 3 times during the 4-hour baking period. I was prepared to bake my recipe twice. I had all my steps written out, and the ingredients lined up separately. I prepared each of my recipes simultaneously, loaded both pans and stuck them both in my preheated oven. What a big mistake that was! Although I had thought about it, I really didn’t plan this right. Baking two large cakes in the oven at the same time will drastically affect how evenly the cakes will bake. This was my drama of the day. I could tell the cakes were baking differently than they had during my trial runs at home. I decided at the last minute to pre-heat another oven and move one of the cakes to a different oven. I allowed them to bake for another 15 minutes and I knew I needed to make a third cake just in case. Let me tell you I was not planning on doing this! There was under two hours left in the competition. My ingredients needed to rest for at least 30 minutes, but I didn’t have time. I had to microwave my butter, eggs and milk to slightly cool them. I threw together a third cake and put it in a third oven. By the way, can I just say that Amanda and Aimee were so kind to let me use their ovens! By this time, my first two cakes were done. The one I moved to the second oven was destroyed. 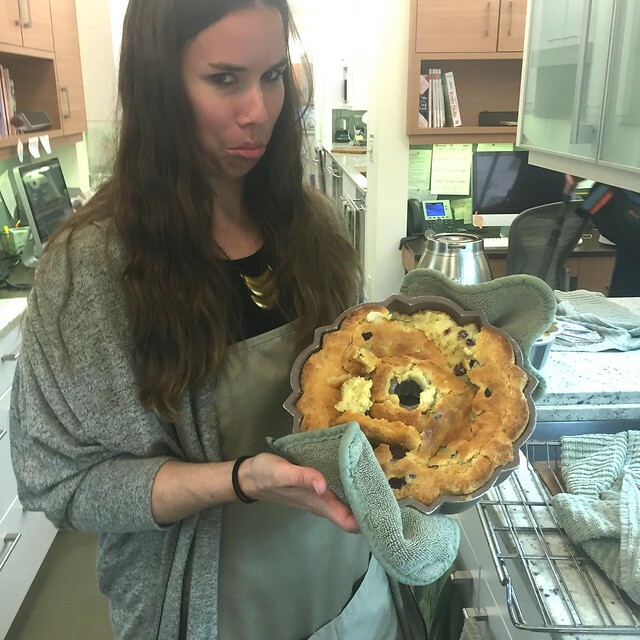 I could tell it had not baked all the way through, and it collapsed. I really wasn’t sure how cake #1 was going to be, but it seemed to bake ok. I was still counting on cake #3 to be the winner. Well it wasn’t (see above photo). 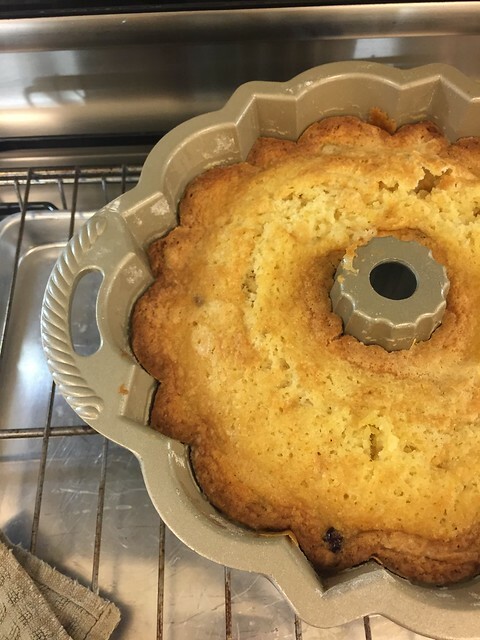 I used a different sized bundt pan, which was too small. My third cake bubbled up over the sides and baked too fast on top. UGH! I was so stressed at this point. I could tell cake #3 was going to be a failure as well. I had no other choice but to go with my first cake from the original oven. 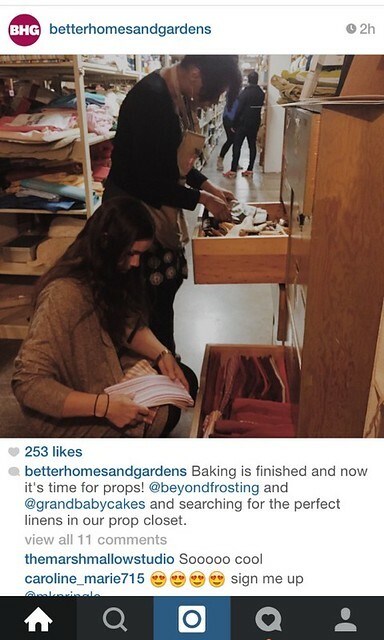 Are you getting lost with all my cakes and ovens yet? I had to take a deep breath and move forward. All the girls were super supportive during the whole thing. I couldn’t have imagined what I would have done without them! I prepared my glaze and threw my cake in the refrigerator to set with 10 minutes left on the clock. Amanda, Jocelyn and I shared a brief toast to end the contest. There wasn’t much time to relax, we were on to the next step. Over the next couple of hours we had to rotate through the prop room, a photography session, hair and make up and video interviews all before the official taste panel at the end of the day. Oh yea, did I mention we were being filmed the whole day? My filmer, Dave, was awesome and totally into the drama. The last time I was in the BHG prop room during my previous visit for the BHG Cooking Experience, I had not imagined that I would be back, and actually able to comb through the prop room to style my own photo shoot! As soon as they said I could pick a backdrop, I just got so excited. I love this photo of Jocelyn and I picking out linens. Serious stuff here, folks! We had 30 minutes to select and style out the shoot in our heads and only 30 minutes to get the shot. 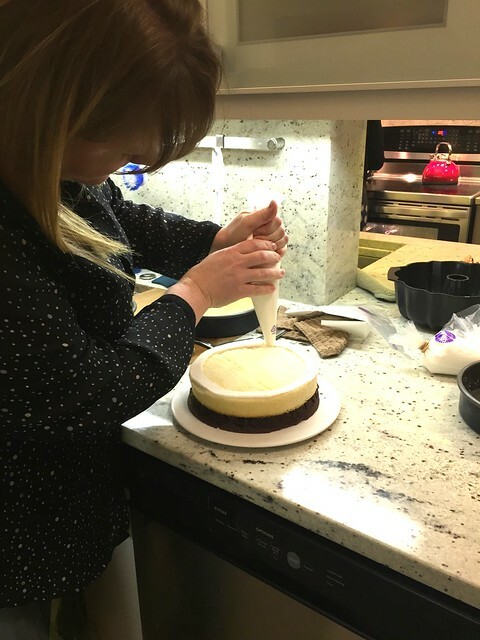 It was just about as stressful as having to prepare a cake in under 2 hours. I had trouble transferring my cake to the cake plate, and even worse, it was too warm to get a good slice. Luckily Karla worked me through it; we got a couple of shots I thought were workable but my time quickly expired. I was whisked away to hair and make up. 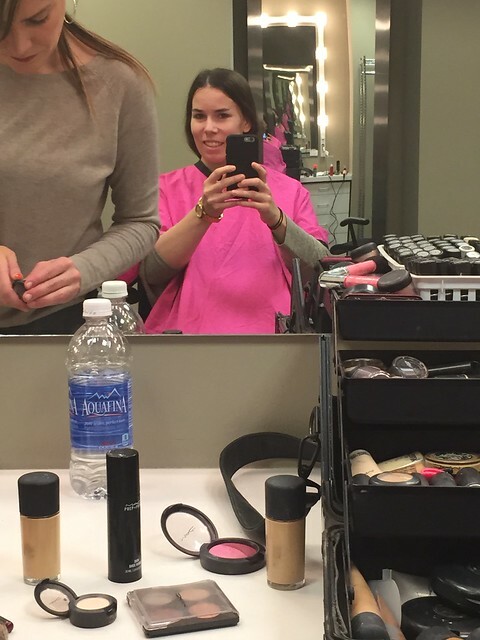 We had to do camera interviews, and I appreciated the pampering. It was the first time I sat down all day and the circles under my eyes were getting darker and darker! I thought the interviews would be harder than they were. 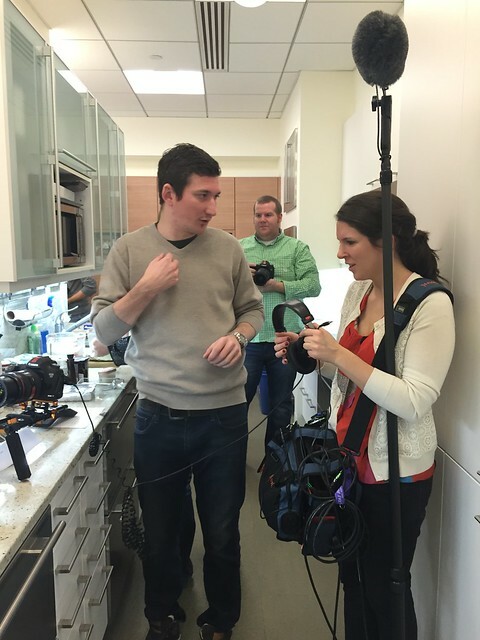 Perhaps it was because I was used to be trailed by the camera crew all day by that point. It was still awkward, but you guys can be the judge. After the interviews, all we had to do was wait for the taste panel. I had to go first. UGH! Talk about nerve-racking. 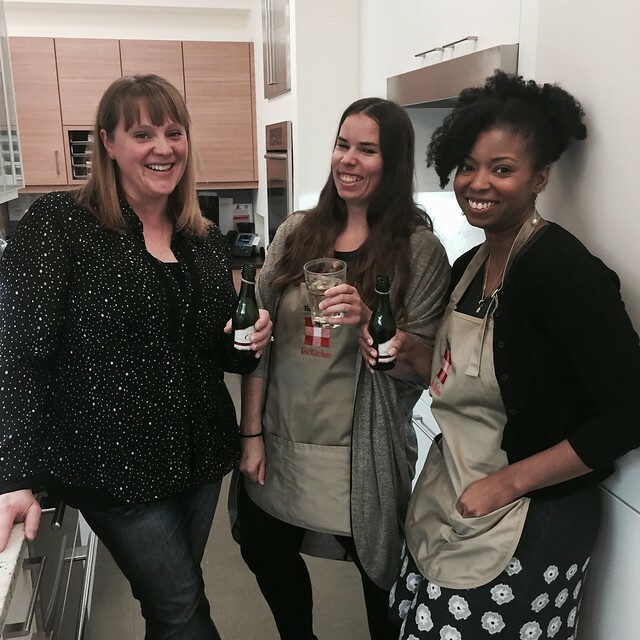 On the taste panel was Gayle Butler, Editor-in-Chief, Nancy Wall Hopkins, Senior Deputy Food and Entertaining Editor, Lynn, Test Kitchen Director and Colleen, Senior Test Kitchen Brand Manager. I walked in, told them about my cake and put my cake plate down on the table. The whole thing was filmed, and I was so nervous that I set my cake plate down SOOOO slowly that I literally had time to think in my head “what are you doing, put the dang plate down. Where is the table?” #mortified. After that, my job was done. I took a HUGE sigh of relief. That evening, we were treated to a delicious dinner at Exile Brewery, and I stuffed my face with a filet and a well deserved beer. The evening ended with a girls’ night in Jocelyn’s suite with a bottle of wine and some late night snacks. Before I knew it, I was back on the plane headed to LA. But not without missing my connection (again). Thankfully there are far more flights from Chicago to LA than there are from Dallas to Des Moines, and I didn’t have to wait more than two hours. It was just enough time to stop by Frontera Grill for my FAVORITE Milanese torta. Seriously, this is the only reason I love the O’Hare airport! 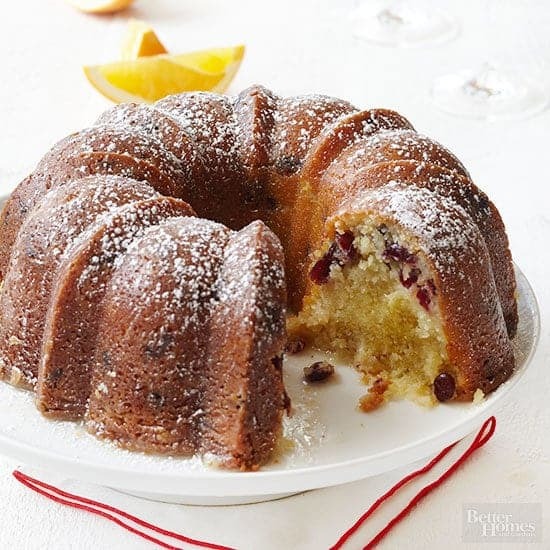 Click here for my recipe for Cranberry Orange Bundt Cake with a Champagne Glaze. 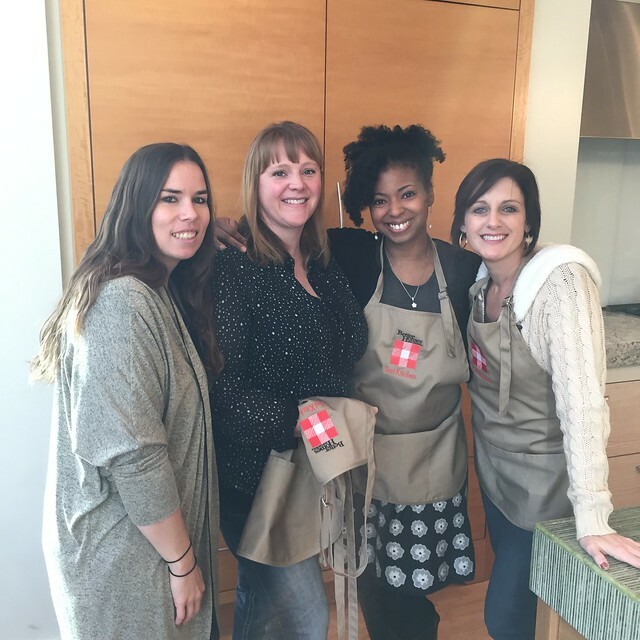 A special thank you to Kenzie, Sarah, Katie, Lynn and the entire Better Homes and Garden’s team for setting everything up and hosting us for the trip! This sounds like SO much fun!!!!! 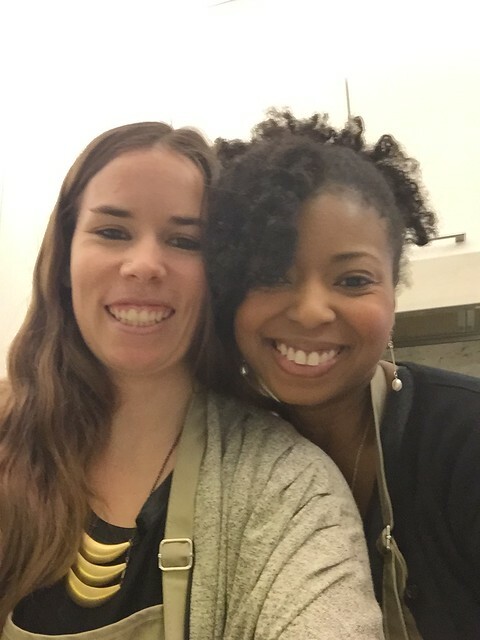 <3 I remember meeting you, Amanda & Jocelyn @ the BH&G cooking experience! 🙂 Congratulations!!!! 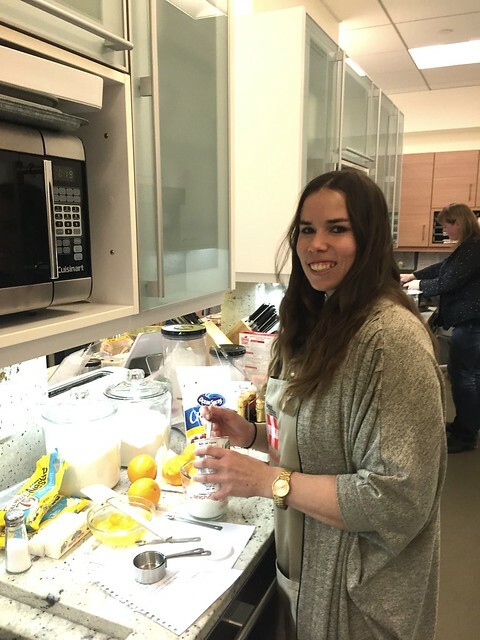 Your no-bake cookbook will be amazing!!! How much is 11/4 Cups milk……? 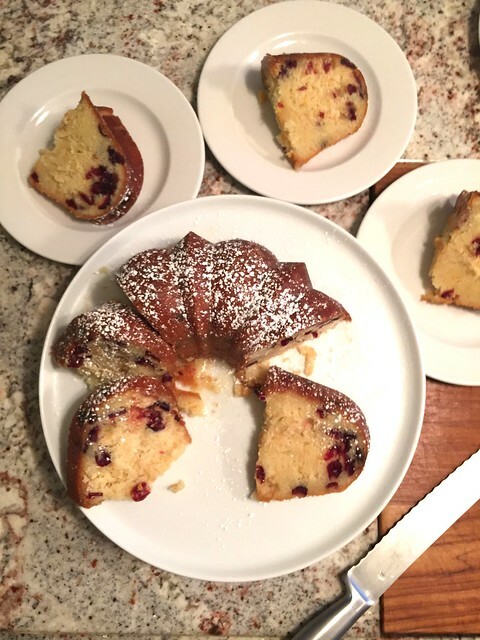 in your Cranberry Orange Bundt Cake? Thank you. Hi Anne, I am sorry, I am not sure what you are asking? 1 and 1/4 cups. Do you need a ml conversation? I am new to the computer and to this site, love to cook I am a (little old) except in my heart and head !!! and disabled but am having fun teaching my new care giver to cook. I saw some wonderful recipes you or betty crocker sent me and that’s how I found you . I not only LOVE your recipes but can’t wait to make this cake. sounds yummy haven’t even read all the ing.yet. hope there is an alternative if you need champagne( don’t drink and don’t like the taste.